Ready for Patch 8.0 and BfA! Unlock DCS' Select-A-Stat™ 2.0 by clicking the lock icon in the upper right of the character paper-doll frame. 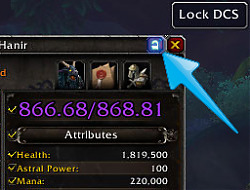 Lock DCS' Select-A-Stat™ 2.0 by clicking the lock icon in the upper right of the character paper-doll frame. Updated translator section in DCSAboutDCS_FS. Italian and Traditional Chinese localization updates. Thanks, infinitybofh and BNSSNB! Changed to longer delay and more attempts at obtaining ilvl. Fixed C_Timer.After calls when the function has arguments. Attempt to fix item:GetItemQuality() invalid returns right after login. Reworded mouse-over tooltip for low-level Mastery checkbox. Enhancement shamans should now have correct GCD displayed. Disabled printing of debug info of 800a108. DejaCharacterStats should have almost non-existant CPU spikes when stats are not visible. Fixed a bug when repair and durability info on items didn't get updated when switching items with the similar names. Characters with alternate power should now have correct amount of mana in PaperDollFrame. Added a new checkbox for display of Mastery depending on character's level. Trying new way to obtain ilvl through mixin. Artifact weapons might display wrong values, so tests in these cases are welcomed. Recalculation of information on items such as repair cost, durability, durability bars, and ilvl now should occur only when PaperDollFrame is open. Deleted .git from the addon so it's no longer a working copy. Removed Heart of Azeroth code that is no longer neccessary. All artifacts should display proper ilvl now. Fixed Heart of Azeroth item Level display for two handed weapons. 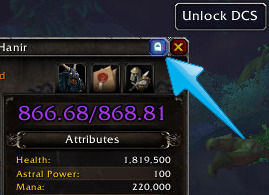 Fixed Heart of Azeroth item Level display issue for realz. Fixed Heart of Azeroth item Level display issue. Fixed login division by zero error. Improvement of new category names. Improvement of stat belonging to categories. Updated the Interface Option's panel to make more sense and look nicer. Added the display of each items item level on each item's slot via checkbox. Further optimized and cleaned up the code. Several code cleanup and compatibility fixes. Fixed a merge issue with repair cost checkbox saved variables. Added Hide At Zero check boxes to display stats even if they are 0. GCD fix for Demon Hunters. Improved display of Mastery for players below level 78. Various other bug fixes, code clean up and optimizations. Removed April Fools 2017 FAKE CODE! SAD! Various other bug fixes and code clean up. 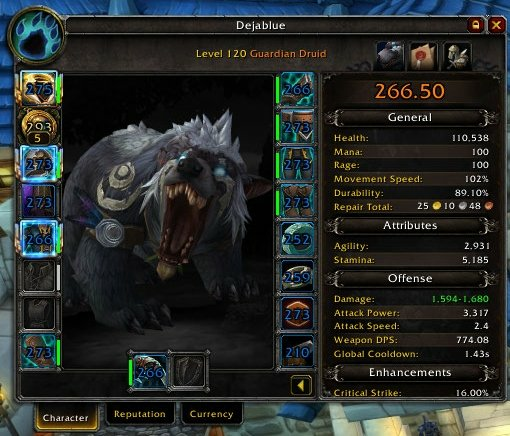 Fixed an issue with Relevant Stats display and persistence due to WoW API changes. Fixed an error with the default scrollbar's 'SetVerticalScroll'. Fixed an issue with ClassCrestBackground checkbox persistence. Fixed an issue with GCD and WoW API change. Fixed an issue with saving between class specs. Added "Ratings" stats for all "Enhancements" stats. Added new calculations for Global CD that should be more accurate. Fixed Maelstrom alternate mana bug. Fixed Death Knight and, still testing, strength class GCD. Fixed Hiding stats at 0 bug. Added updates to Simplified Chinese localization. Thanks C_Reus! Added old Blizzard bug interface options workaround (double call) for /dcstats config. Fixed a bug where the Class Background and stats would show when the Interface Options panel is opened. Fixed class background and stat persistent visibility re-parenting issue. Fixed initial character login relevant stat initialization. Added Reset Stats/All Stats button mouseover text. Fixed scroll bar display and persistence issues, for the most part, see Known Issues below. I am sure there is more stuff fixed that I forget. An error may occur with "SetVerticalScroll" being a nil value. This is being investigated. The Reset Stats/All Stats button does not properly display it’s state when changing talents, it shows the last state it was in before talents change. When close to the threshold of filling the character stat display the scroll bar can display for a moment before it disappears as it iterates and calculates its display height. This is likely tied to the alternating background highlight bars. The alternating background bars expand and contract while being iterated and calculated. This is a minor annoyance and should not cause any issues other than minor, temporary, display annoyances. German localization's display of the phrases for "Movement Speed" and "Repair Total" fill the display and make the value difficult to see. On-item repair totals display non discounted repair cost when at a vendor that has faction discounts. Added Interface Options panel stat options interface. Added Durability total back as a stat. New translations for Russian, German, and Traditional Chinese localizations. Fixed localization strings for Weapon DPS, Global Cooldown and Repair Total to not have a colon after the tooltip header stat but between the header and number. Blizzard default English doesn't have a colon anywhere on any stat tooltip header. Made Reset Stats highlight all checked stats when clicked. Set scroll position to the top when the frame hides and when the DCS Lock/Unlock config button is locked. Set the defaults for Average Durability, Item Durability and Item Repair Cost to unchecked. Scroll bar is not persisting between interface options and paper doll. Movement Speed doesn't always update properly. Closing and reopening the frame fixes it. Individual item repair costs may show prices from the last visited faction and be inaccurate for another faction's repair costs. When used with ElvUI the Item Level display reverts to show the Blizzard default of current equipped item level only with no decimals. Fixed GCD for Druids, Hunters and Rogues. Made on stat panel option buttons hide when the frame hides. Added Weapon DPS for auto-attack (white) damage. New localization phrases translated for Russian. More on the way for other locations as they come in. Other small things I forget. Added a quick dirty fix for a longstanding Blizzard typo causing a bug. Most of these changes are contributions by loudsoul. Thanks loudsoul! Huge rewrite of options to integrate them with the new core code. Added stat selections saved per Spec not just per character. Fixed scroll snap reset bug. Made scrolling based on number of stats shown. Fixed no attributes stats selected enhance stats reference bug. Added Simplified Chinese localization translations. A bazillion tiny details I forgot. Added Global Cooldown (Global DC) to the Haste tooltip. Updated Traditional Chinese localization translations. Added Decimals option for item level. Improved, and hopefully fixed, the stat scrolling reset bug. Added German localization for "Movement Speed" as "Lauftempo". Separated options into left side as global and right side (Stats side) as per character. This should help until profiles are completed. Fixed division by zero error with durability calculation. Implemented a quick combat lockdown fix for Oilvl compatibility. Fixed equipment manager mouse scrolling bug. Implemented mad hype for profiles! Option to show hide the show hide button. Separate out durability and gold repair cost to be individual and larger and in the middle of the display but as is when both are selected. Durability is not updating on the shirt/paperdoll guy or on the stat frame, they are updating differently as well. Fixed an issue with the scrollbar's max value settings. Fixed an issue with the stat frame not displaying on show. Made the saved variables database more robust. Fixed an issue with the Titles Panel not being scrollable. Added the item level display to characters below level 90. Added Durability and Repair Total stat frame check boxes. Tweaked the shift-scroll snap values to be useful for Protection Warriors and Brewmaster Monks. Changed the default snap scrolling limits to be appropriate per option. Increased max scroll frame and snap values. Minor bug fixes and release. Added the ability to select which stats to display. Changed scrolling to only work with modifier keys shift (snap top/bottom) and control (slow scroll). Fixed display issues with movement speed and regen stats. Rearranged options to be more logical in order of importance. Fixed several minor issues; spelling, x,y alignment, etc. Added durability and repair display options. Added expand and collapse button. Added the ability to scroll the state frame. Added option to show a scroll bar on the character stats pane. Added and character stats panel show/hide button. Added two options and relative saved variables. Added option "Equipped/Available": Displays Equipped/Available item levels unless equal. Added option "Decimals": Displays "Enhancements" category stats to two decimal places. Fixed various display issues due to new Legion build. Added display of both equipped and total item level. Moved the item level display to where it should have always been. Adjusted frames so that certain tank specs did not have stats overflow off the panel. Moved the item level display above the character level text so that stats do not overflow off of the bottom of the character stats panel. It's much easier to use this site, especially for those of us running Linux. Please update the version here so we don't have to go to Curse/Amazon! Thanks for the update! I've been using this for some time now. I added a quick fix for the localizations issues. Literally what is posted below. So do it manually yourself as described below or wait for the updated I pushed to post. Happy Thanksgiving. Thank you all so much for the quick feedback! This is a long time Blizzard bug. This is in Blizzard's core default code so I will ahve to add it manually when I get a chance. Thanks. Looking at it now. "Added back the show/hide button"
Bless you. Bless you, kind sir.